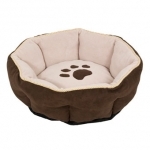 Petmates variety of small dog/cat beds are perfect for furry pets that love to curl and cuddle up for a heavenly snooze. Bolstered sides help promote nesting and reduce exposure to drafts. 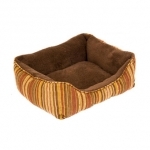 Soft plush lining is thick and soft so your pet will love to snuggle into it. Made out of attractive high quality fabrics and filled with high loft polyester fiber fill. Machine washable cover for easy cleaning. Pets can rest comfortably while their pet parents rest easy, knowing that good pet beds are more affordable than ever! With Petmate value bedding, pet parents can get the style and comfort theyve come to expect at great prices. 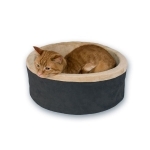 The K and H Thermo-Kitty Bed has a dual thermostat 4 watt heating unit buried deep within its thick, super soft, orthopedic foam base. It warms the surface 10-15 degrees above ambient air temperature to your cat&#39;s normal body temperature when in use. The washable cover is attractive in any room in the house. Indoor use only. One year limited warranty.